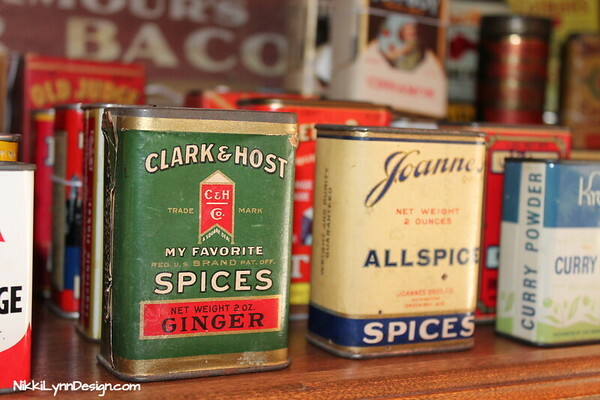 Tins Signs Advertising Americana photography. 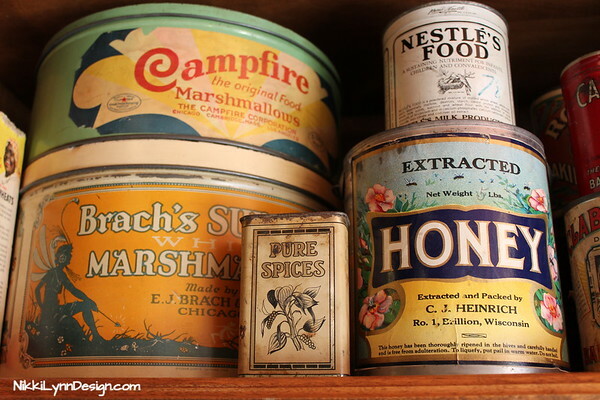 Old advertising signs, old kitchen tins & additional vintage and rusty, dusty & old stuff I find. A boatload of old wooden soda bottle crates. 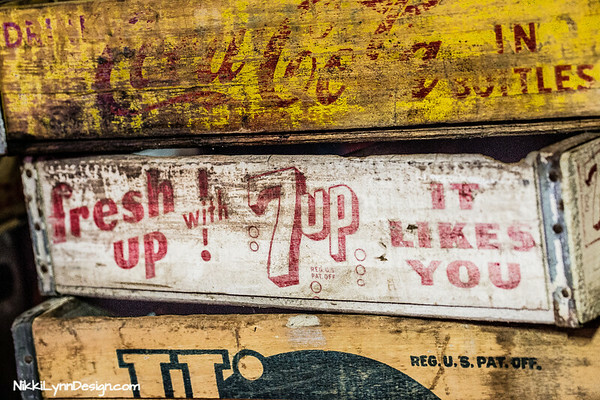 Do you remember the days of buying wooden crates in bottles and returning them? Mountain Dew was invented in the early 1940’s. 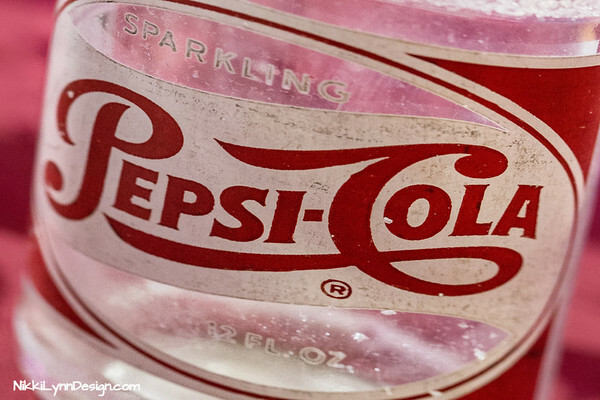 Pepsi bought the company in 1964. There were dozens of imitators from Caca Cola, Sun Drop and more. 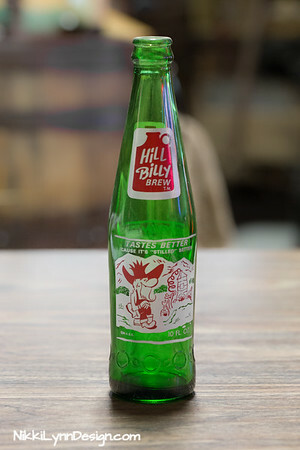 There are some online suggestions that Hillbilly Brew was Ma Cherie’s version of Mountain Dew. Ma Cherie put out various flavor drinks (orange, grape, probably more) in the 60s. I believe Ma Cherie was a St. Louis company. 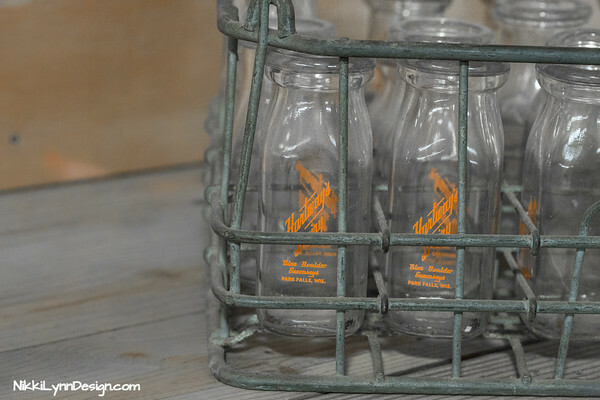 Hartway’s Dairy Old Milk Bottles from Haraway’s Dairy Blue Boulder Guernseys in Park Falls, Wisconsin. 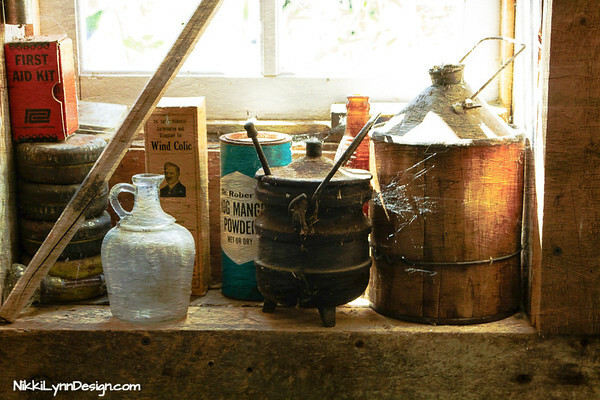 The bottles date back to the 1950s. Sometimes I seriously believe I was born into the wrong time period. 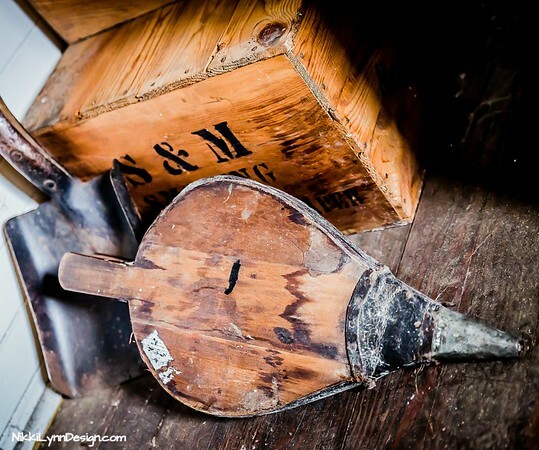 All my loves are of things from decades that have passed or is that part of the obsession? I can’t decide. Major tin collecting going on at someone’s property I know. 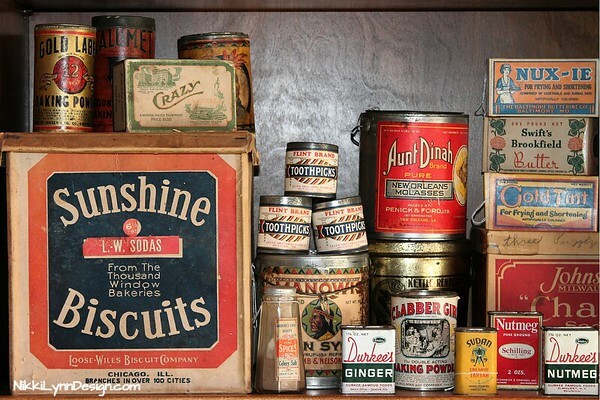 He collects the tins, I collect the pictures of his tins. I love spending a day re-arranging all his “stuff”. Thankful to be able to play around and create some rather neat shots. Oh, snap! Here I go again. I am playing around and rearranging my buddies tins. It is like building blocks for people that see the beauty in them. They just fit together so nicely. This time I am rearranging our buddies old bathroom supplies. One man’s trash is another man’s treasure. Our buddy sees the beauty in his collection, as do I. 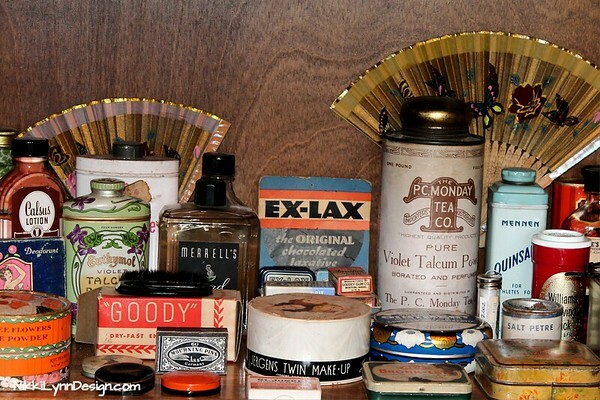 An assortment of vintage bathroom supplies. 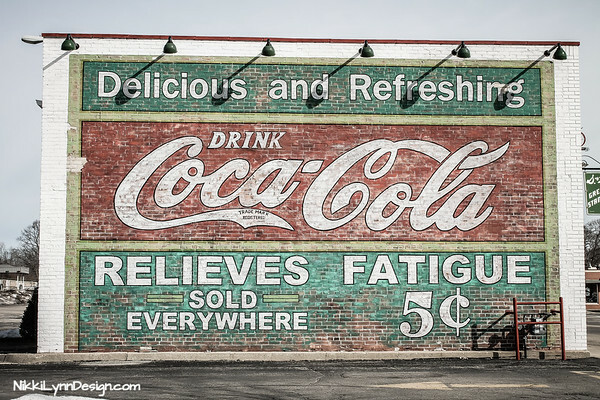 A Coca-Cola advertising sign that was painted on the side of an old brick building in a small town in Wisconsin. I’d tell you where but it was a gas station stop and I didn’t write it down. Found in an old railroad car that is no longer in service. Date on the box states 1930 and includes the ingredients: lady’s slipper root (drug active ingredients) black cohosh root (drug active ingredients) unicorn root (drug active ingredients) blue cohosh root (drug active ingredients) Oregon grape root (drug active ingredients) viburnum (drug active ingredients). Although nowhere does it state what the product is used for on the outside, directions must have been on a piece of paper inside the box. 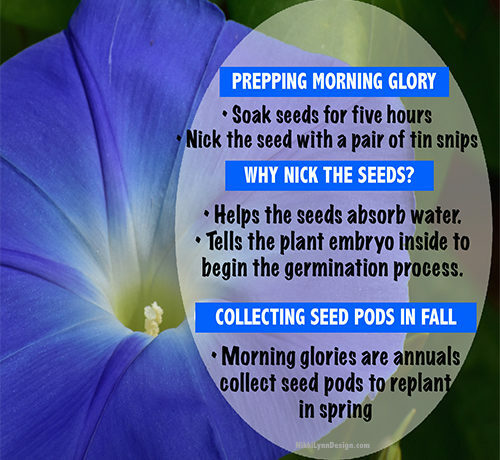 The history behind the S.B. 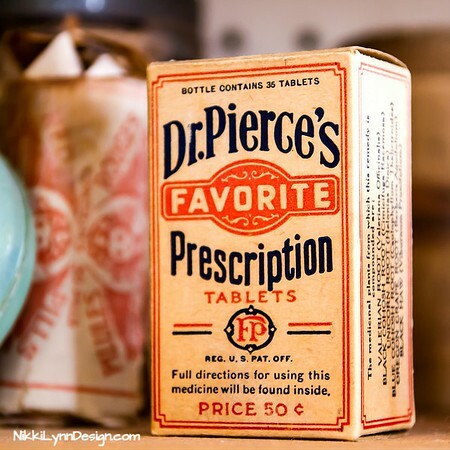 Penick & Company, that produced this apothecary boxed pressed herb is interesting. 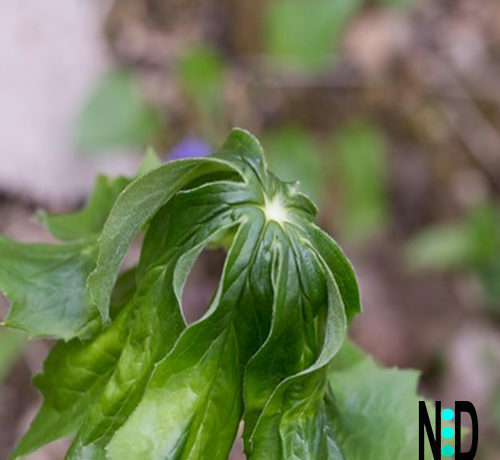 S.B Penick gathered botanicals for herbal remedies from the woods and fields of his Southeastern home. 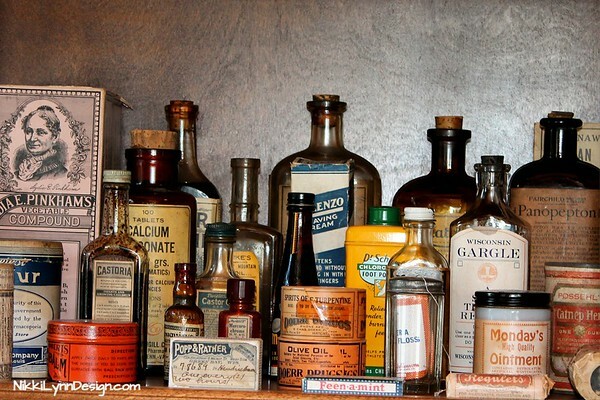 Long before professional doctors and hospitals, all medications were made from resources found in nature and administered by a family member, local medicine man or an appointed town physician. S.B. 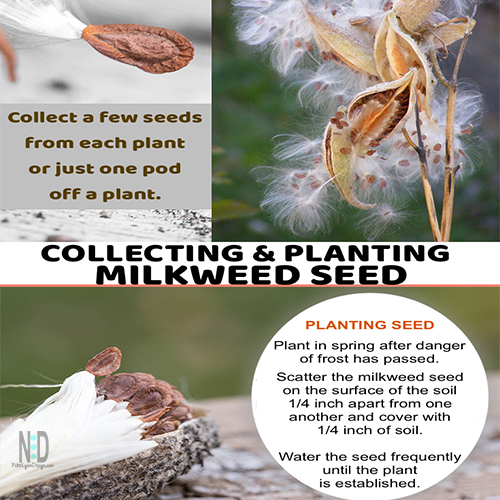 Penick made it his job to know botanicals. “S.B. Penick, Sr. founded the Company in Marion, North Carolina in 1914. Its beginnings were humble, as merchants and millers of drugs of vegetable origin gathered from nearby fields and woods. 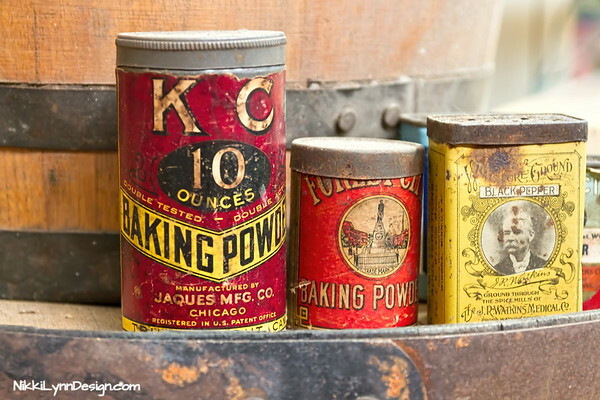 World War I created huge demand for the Company’s products and led to significant expansion, acquisitions and the opening of a plant and offices in New York. The pattern of internal growth coupled with acquisitions continued into the mid 1960’s when a multinational conglomerate corporation acquired the S. B. PENICK COMPANY. 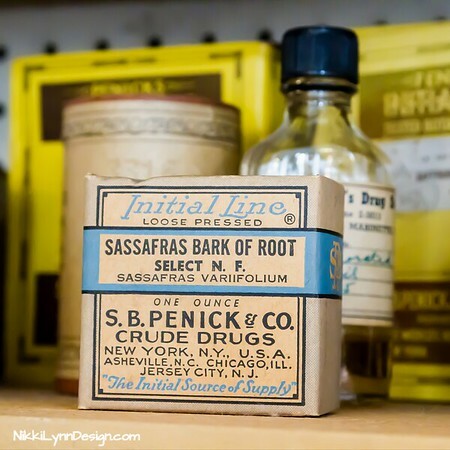 At the time of its acquisition S.B.Penick was considered by many to be the largest supplier in the world of botanicals for pharmaceutical and allied uses. 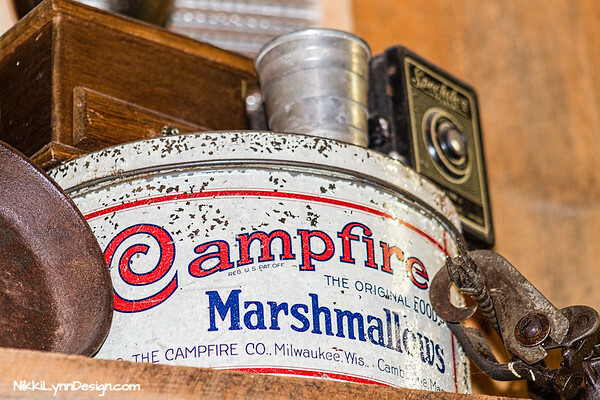 Campfire marshmallow tin from the Campfire Company out of Milwaukee, Wisconsin. 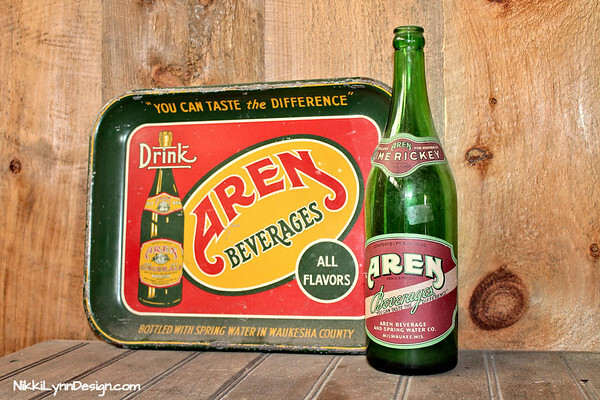 Aren Beverage Company in Waukesha County bottled all their beverages with Wisconsin spring water. Your retailer will be glad to pack you an assortment of 24 Mars Confections. You have for your selection Milky Way, Snickers, Forever Yours, Mars and The Three Musketeers. A Mars Confection for every candy taste. 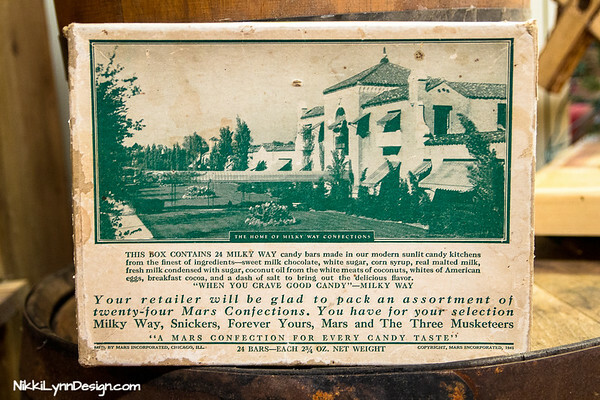 In 1926, it Milky Way came out in two flavors: chocolate nougat with milk chocolate coating, and vanilla nougat with a dark chocolate coating, each for a nickel. The vanilla version, with a dark chocolate coating, was called “Forever Yours” and it was produced until 1979. In 1989, Forever Yours was reintroduced and renamed Milky Way Dark, and later Milky Way Midnight“. 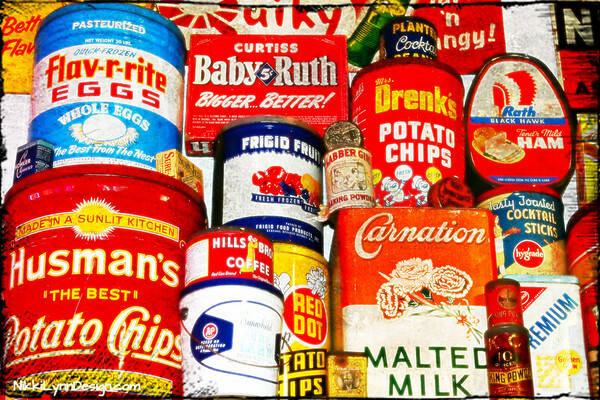 Collection of vintage kitchen food tins from companies like Nestle and Brachs. Where old signs Green Bay, Wisconsin street signs go to die. 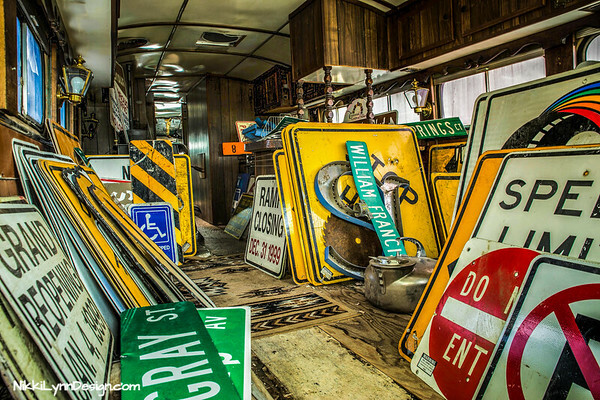 Literally, a busload of old road signs. 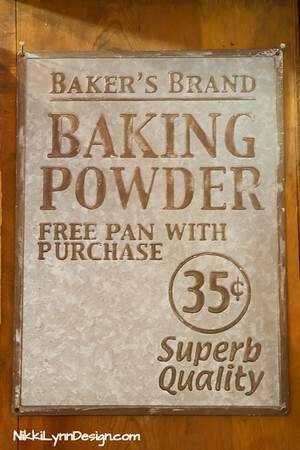 Steel signs would grace the walls of the supermarkets back in the day to promo new products and to market deals. This sign was one of them. 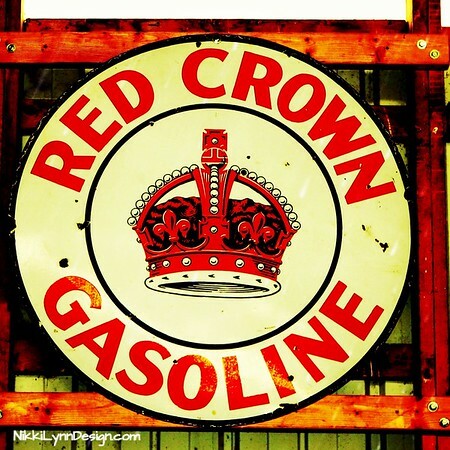 Red Crown gas was made by the Standard Oil Company and this is one of their enamel gas station signs. 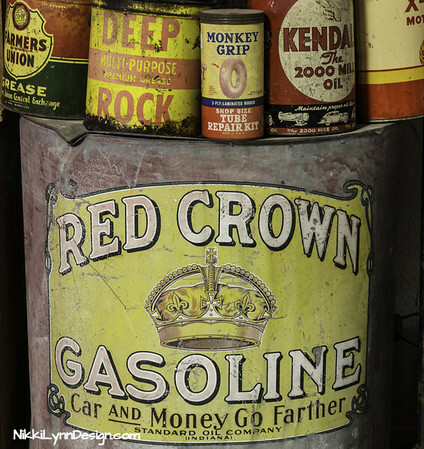 An assortment of gasoline cans and vintage garage product cars. 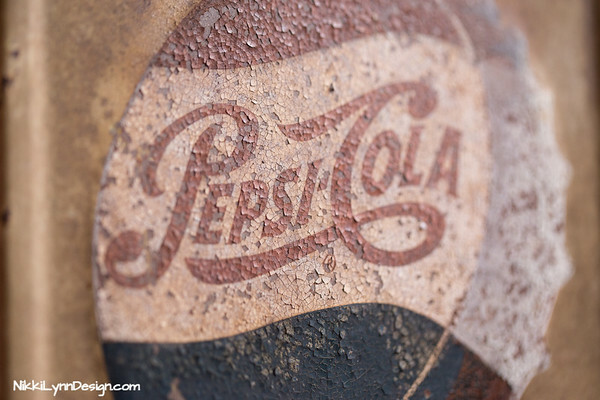 An old Pepsi Cola sign, the peeling of the paint gives a person a feel to the age of this masterpiece. You got a lot to live and Pepsi has a lot to give! Can you imagine having this job? 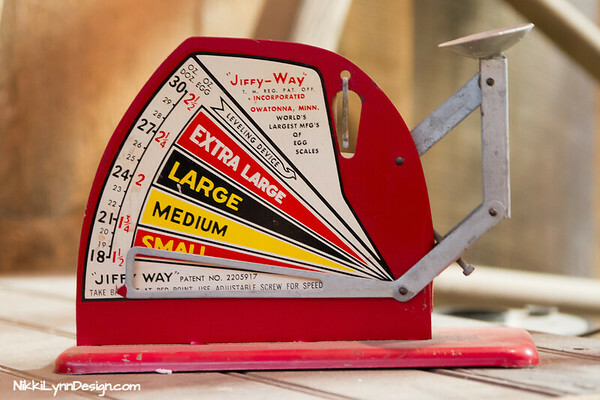 This scale was once used to sort eggs sizes. Small, Medium, Large and Extra Large; eggs. 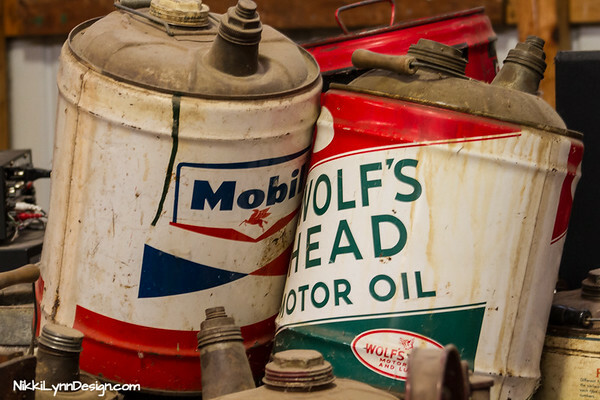 Old Mobile and Wolf’s Head Motor oil cans. 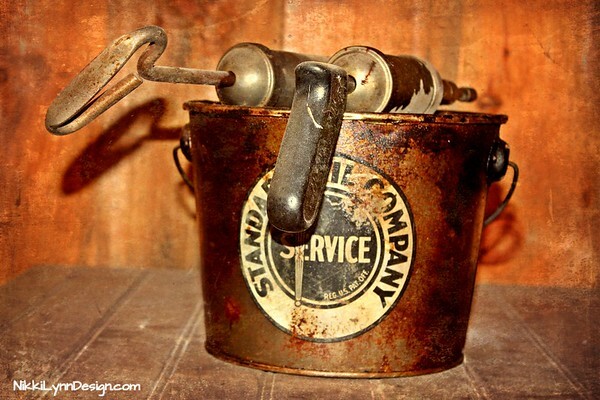 Standard oil company oil bucket and grease gun. 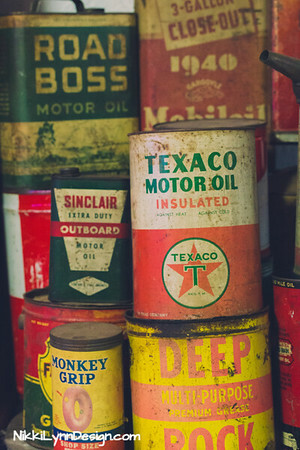 Deep Rock, Road Boss, Sinclair and Monkey Grip old motor oil cans. 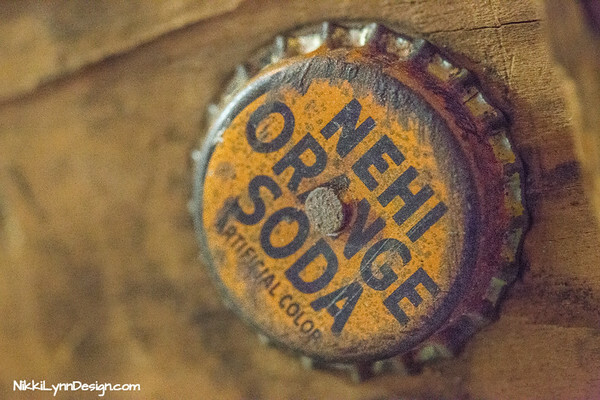 Nehi Orange Soda cap. Nehi (pronounced “knee high“) is a flavored soft drink that originated in the United States. It was introduced in 1924 by Chero-Cola/Union Bottle Works. In 1955, the company changed its name to Royal Crown Company, after its RC Cola brand. It was founded by Claud A. Hatcher, a Columbus, Georgia grocer, who began bottling ginger ale and root beer in 1905. In April 2008, Nehi became a brand of Dr. Pepper Snapple Group in the United States. 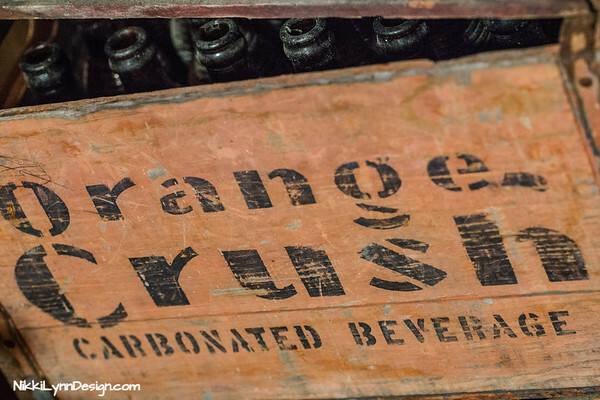 1960’s, wooden, Orange Crush soda crate. The crate is painted orange with black stenciled lettering. All the bottles were intact. Sweet!! 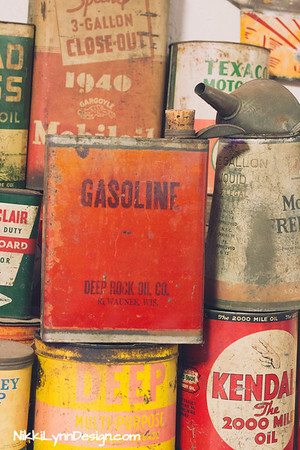 Gasoline can and oil cans. 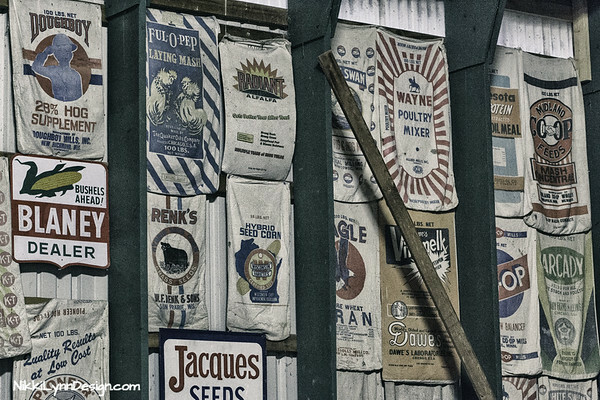 An assortment of old farm feed bags. 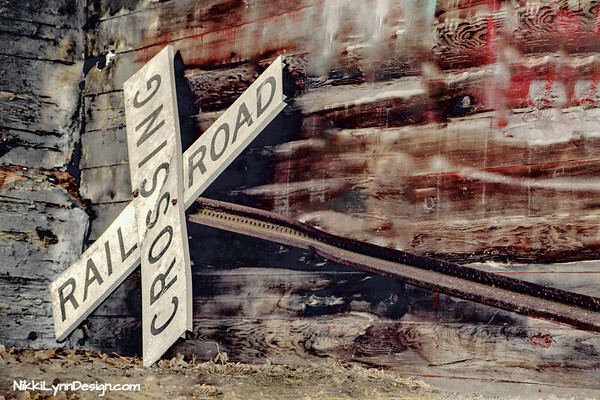 Found in a broom closet of an old railroad car. 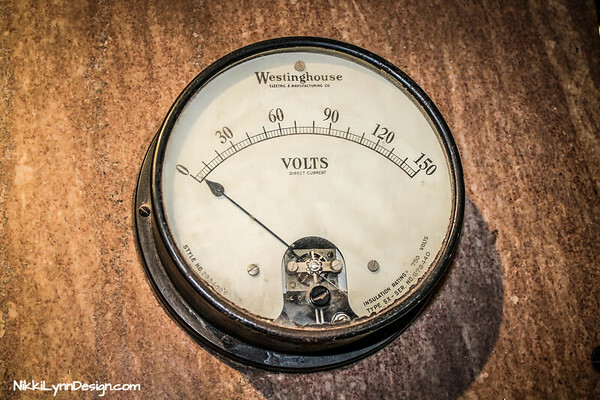 The items were used to stoke fires in the engine coal room to power the trains. 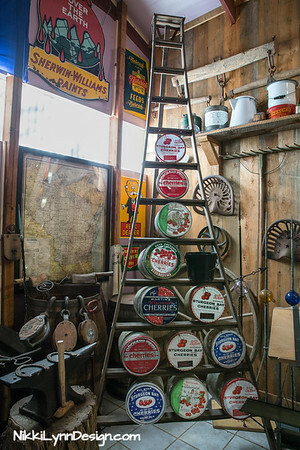 This window assortment caught my eye when visiting a Door County cherry orchard to pick my own cherries. 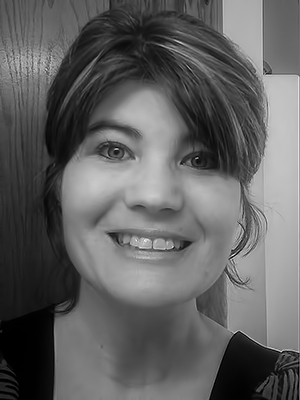 Because I just felt like playing around with processing – you hate it? That is ok…someone will like it. Art is meant to speak to people. This didn’t speak to? You just keep scrolling, you will find something that does. Each piece is not for everyone 🙂 That is why we are called individuals, having the choice of individual taste and selection. 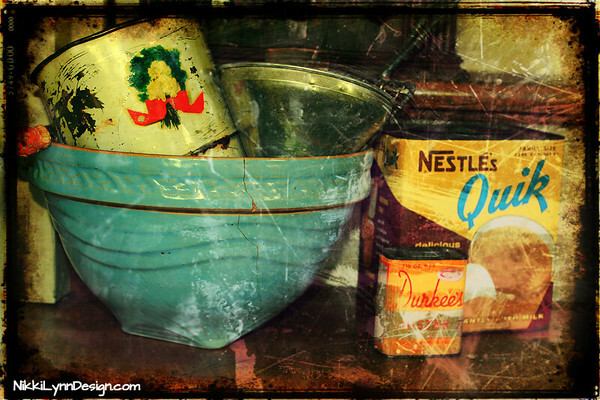 Vintage kitchen wares. 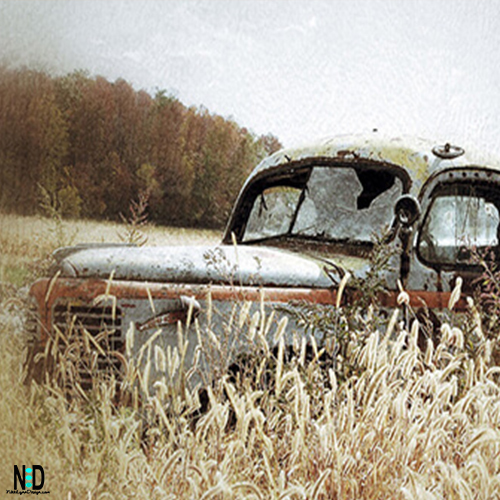 I really enjoy the processing of this photo for the distressed looking photos I take pictures of rust and such and apply them as textures to certain photos. The end result is always different according to the pictures I combine. Another photo I played around with adding some texture too. Door County, WI was once known as cherry capital of the world. Yes, as long as you use the buttons on this site to share to Pinterest, Facebook & Twitter – no issues. 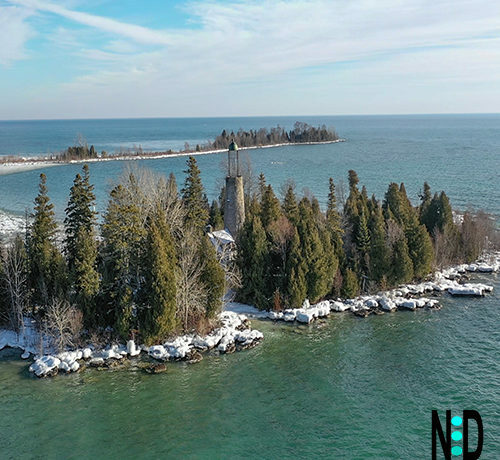 (Tourism on social media has a green light too) Just do not use the pictures on your own website – licensing fees apply for personal & business websites.